We additionally offer Beginner Level and Intermediate Level Bike Confidence Courses for small groups. I am a 50 year old Mum. I cycle, swim or run nearly every day and I am passionate about nutrition and health for me and my family. I believe that anything is possible with the right self-belief and support. In 2016 I became an Iron Mum. Coaching: I am a personal lifestyle transformation coach specialising in helping YOU cross your personal finish line. Goal setting, nutrition, focus and accountability are the foundations supporting you to finish your first triathlon or smash your own personal results in an outdoor fitness challenge. I am a Cycling Australia accredited cycling coach and have helped many women gain confidence on their bikes as well as improve their performance. I coach triathletes at all levels and I work with women in areas of health and nutrition, mainly around weightloss. 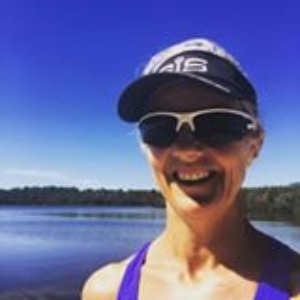 Sporting Experience: I have completed hundreds of triathlons, ocean swims and running races and have represented Great Britain twice as an age group triathlete. I competed Cairns Ironman in June 2016 at the age of 49 and regularly compete in triathlons across Australia. Passion: I have helped hundreds of men and women achieve a personal transformation. I am passionate about delivering simple healthy food and fitness rules to recharge the energy, health and fitness of men and women across Australia. I want you, no matter what size, shape or experience, believe in yourself and succeed in outdoor fitness challenges. Let me help you rediscover yourself – start the journey today. Success. Coach Liz Stapleton has been notified of your message.